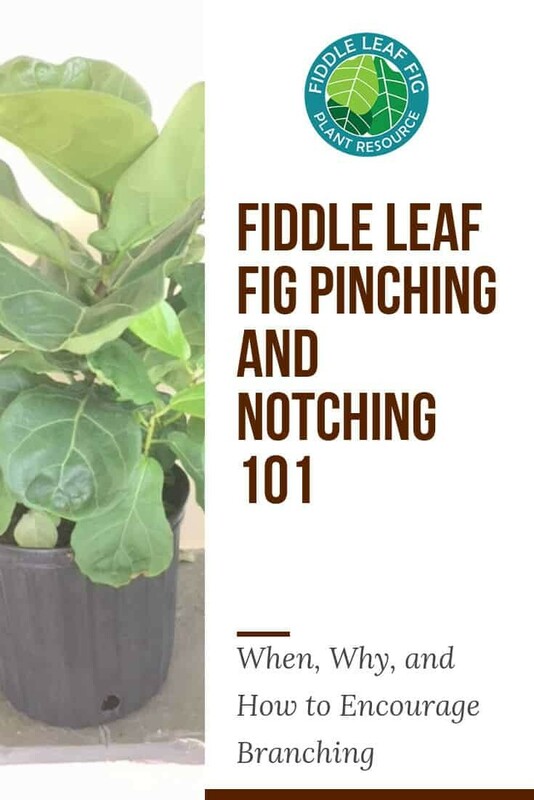 If you own a celebrated Fiddle Leaf Fig Tree, you’ve probably thought about what you can do to get it to grow new branches. Fiddle leaf fig notching is a fairly advanced strategy. Today, we’ll break down what you need to know to get new growth right where you want it with notching and pinching. 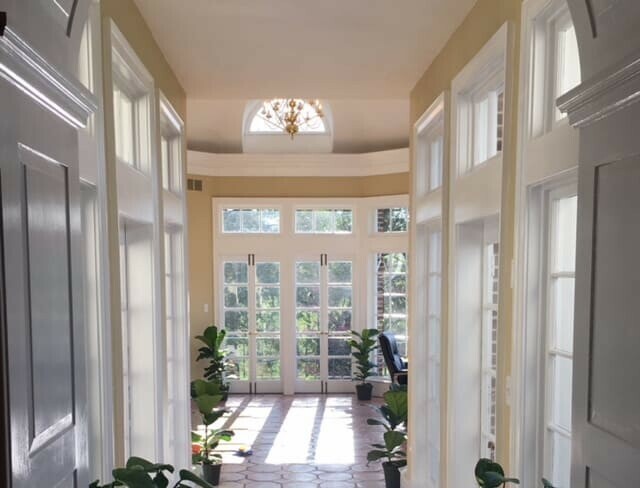 We all know the story… the hapless home decorator falls in love with a fiddle leaf fig and hops online to find a local retailer that may sell one of these charming indoor trees. Dropping everything and running to her local nursery or home improvement store, she arrives to find a few dozen small, bush-looking plants. Confused, our protagonist double checks the label against what she’s sure she came for. She shrugs and buys the thing, assuming it will magically transform it into a lovely tree someday. 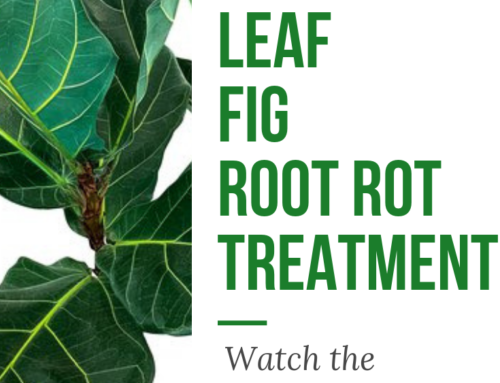 To turn a fiddle leaf fig from a bush into a tree shape takes intentional work from you, the plant’s caregiver. 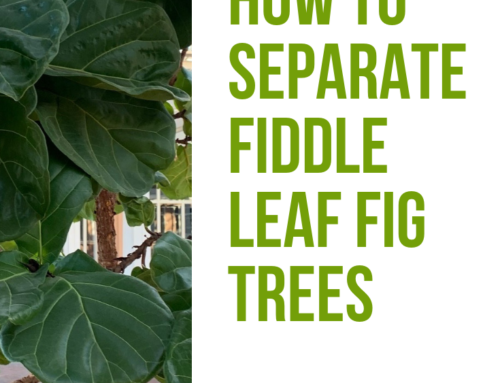 Thankfully, we’re here to show you when and how to pinch and notch your shrub-shaped fiddle leaf fig plant – and eventually, transform it into a tree. Here is a picture of my four fiddle leaf fig trees in the first day I brought them home. Like most starters, they were about two feet tall. 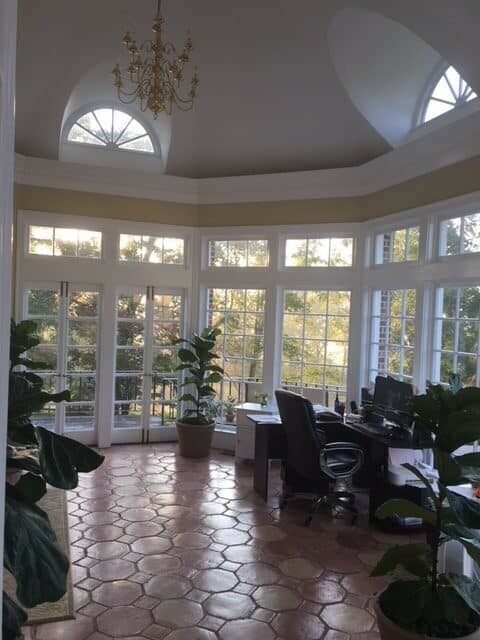 A few months later, I saw they were responding well to my home office (a sunroom type space), watering regimen, temperature, and relational climate. They were thriving. I was overjoyed. Around this time, I noticed these were simply taller versions of the same plant I had brought home originally. In other words, where were the branches I was supposed to start seeing? First, I decided where I wanted my first branch. Next, I located a node nearest the desired branch position. Nodes are the almost-imperceptible thickening of the trunk located between leaves. Then, using a sharp knife, I made a 1/8 in deep cut into the trunk of the plant just above that node. The immediate appearance of white, sticky sap startles some growers, but this is completely normal and healthy. This is called fiddle leaf fig notching. 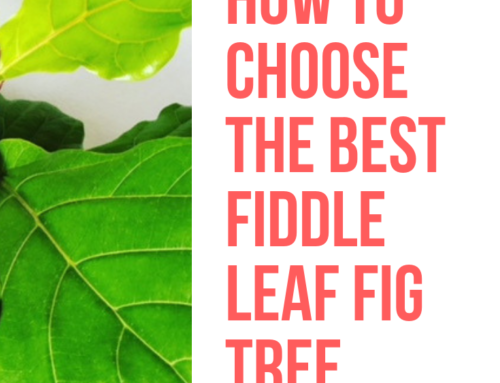 Notching a fiddle leaf fig tree encourages the tree to develop a branch at that location. 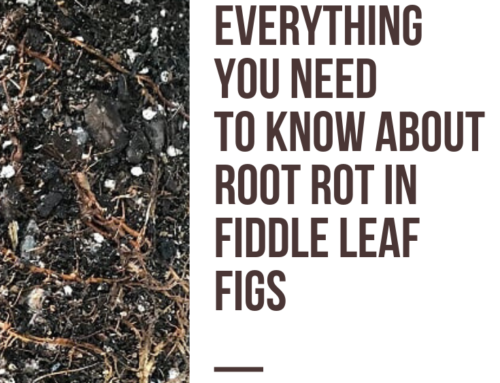 First, locate the newest growth on top of your fiddle leaf fig plant. Using high-quality pruning shears, cut this new growth off. Again, you’ll see sap appear immediately. When it dries, you’ll see a dark scab. 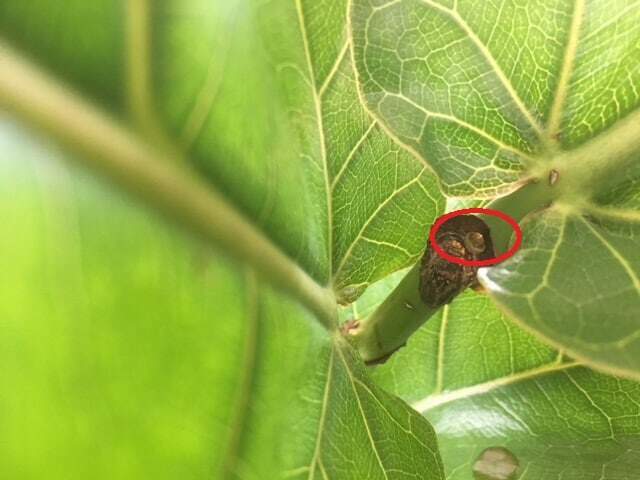 Pinching the top of your fiddle leaf fig forces it to branch out at that location. If all other conditions are favorable, then this branching should take less than 2 or 3 weeks to appear. 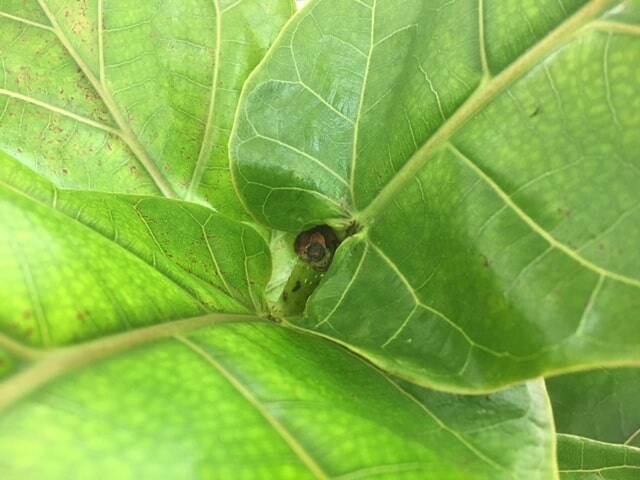 It’s been a year since I first pinched that original shrubby fiddle leaf fig above. It is now over 9 feet tall and has many big, beautiful branches. Pinching and notching should both be done near the beginning of or in the middle of the growing season. Never pinch or notch your tree unless you can safely let it recover for a few months after the treatment. 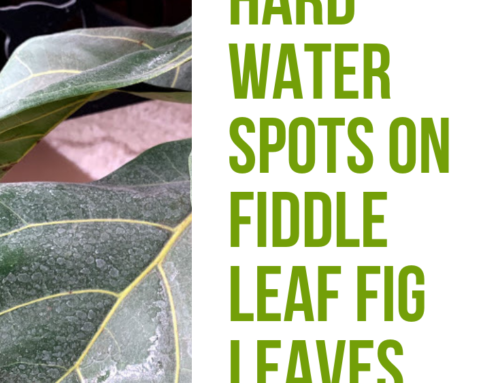 For example, don’t cut or pinch a fiddle leaf fig if you know you’ll be moving its location or changing its watering/feeding routine in the near future. Oh, and since knifing your treasured plant will always test your grit, don’t do it alone. 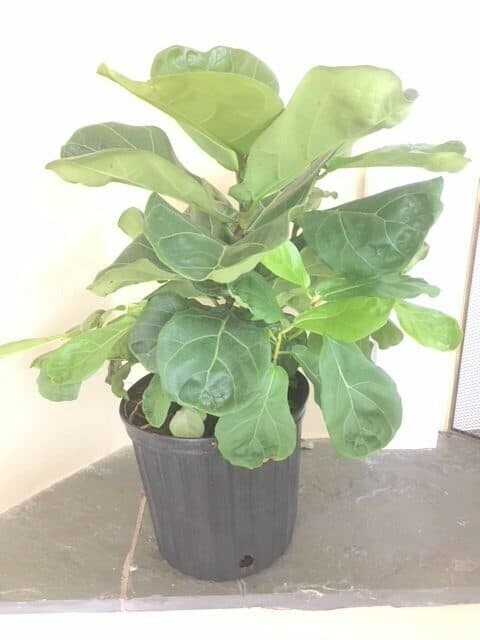 Pop into the friendly Fiddle Leaf Fig Plant Resource Group to get some encouragement and tips from fellow ficus lyrata owners who have lovingly pruned and pinched their own beloved trees (and lived to tell the tale). And don’t forget to share your own before-and-after photos!